Sporting fabulous hats from One Fresh Hat, a small merchant from Ellicott City, MD. To help get you get started, our team has curated a special Holiday Gift Guide of our favorite new discoveries, including; artists, crafters, makers and other small merchants. We’ve had the pleasure of meeting many of these inspiring entrepreneurs and to learn more about their work and their passion. We hope this list helps you find something extra special. Mark and I met Kim Meacham, the co-owner of Milk Street Soap this fall during a rainy, chilly and very muddy craft fair. Kim and her daughter Whisper (I love that name!) blew us away with their boundless enthusiasm. They live on Ocracoke Island, NC, where they make homemade soaps and green living products using meticulously sourced earth conscience ingredients. They joked about how they perfected their products by 'human' testing them on approximately 750 of 800 island residences. We were so inspired, we bought a huge stack of amazing soaps for stocking stuffers. We plan to visit their shop this summer on our annual OBX trip! 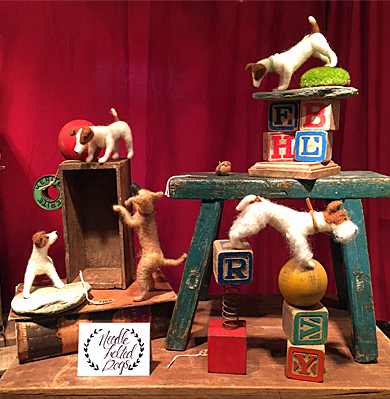 Tracy Shue, owner of Walking Olive in York, PA, creates the sweetest needle-felted dogs you’ve ever seen. From Irish Wolfhounds to spotted Bull Terriers to Bernese Mountain Dogs, you can tell each pup is hand made with love. They make perfect ornaments for your dog-loving, loved ones. Plus, a portion of each sale is donated to organizations doing good work for animals. Her craft fair displays are amazing little vignettes – I see a children’s book deal in her future! Who wouldn’t love to receive the best homemade pie in Virginia this holiday season? (And I literally mean the best pie according to Buzzfeed, Delish.com and Washingtonian Magazine.) Heather Sheire and Wendy MacCallum, co-owners of Arlington’s Livin’ The Pie Life, started selling pies at the local farmers market before moving to their cute as heck shop on Glebe Road. They make everything by hand in small batches using locally sourced ingredients and no additives or preservatives. Fair warning: Their pies sell out fast! They start taking holiday orders on December 1st. Here’s a simple way to turn your favorite Instagram posts, vintage photos, or random selfies into original, custom artwork. Emmie Bean digitally illustrates your photos and creates a completely original keepsake, that’s suitable for framing – and perfect for a modern home’s decor. And if you’re not sure what image to use for your incredibly thoughtful and unique gift, she offers gift cards on a beautiful handmade mini wood clipboard that are good for one custom portrait. Flavia at a Stylish Patina watercolor workshop. Give a creative loved one (or even yourself!) the gift of a little ‘me time’ with a gift certificate for a workshop at Stylish Patina in Falls Church. Flavia, our Design Assistant, just participated in their two-hour watercolor workshop (that’s her on the left)! Making time for yourself can help you recharge, refocus and rediscover things you love to do. Consider giving someone the gift of (creative) time. Founded in 2016 by Arlington resident Janet Hamilton, Farrier Leather specializes in gorgeous, functional and sustainably made leather goods. All Farrier products are created with full-grain, vegetable-tanned leather from pastured cattle. Their linings are made from Global Organic Textile Standard certified organic cotton. Farrier strives for higher standards for the materials chosen to support the earth, the human lives, and the animal lives affected by production. Lauren Rider, owner of Rider Ceramics, is a true small business inspiration. A few years ago, she left her day job and went all in with her ceramics. She creates bowls, pitchers, and planters in bold graphic designs. Everything is wheel-thrown in her basement studio. You can find her work at specialty boutiques in her hometown of Philadelphia and on her Etsy shop. I met Karen O'Leary, owner of Studio KMO, this fall at a maker fair in DC. Karen creates beautifully delicate, incredibly intricate hand cut paper maps. She hand draws each map and then uses an x-acto blade to make each precise cut. The result is minimal, sleek and simply gorgeous. Her maps are the perfect gift for remembering a favorite travel destination, someone’s hometown or a city that inspires.